Broken, outspoken, and eagerly unafraid to call out the whole world, “Pump Up the Volume” is a high school movie like you’ve never seen! The movie was made by a Canadian filmmaker, Allan Moyle, in 1990. In his career, Moyle has worked in many genres, from crime thrillers to sci-fi horror to sports dramas, but he is best known for his coming-of-age music comedies. “Pump Up the Volume” is one of Allan Moyle’s most highly-acclaimed movies. It was instantly popular with audiences worldwide and earned itself a sizable fan following, remaining one of the most beloved cult classics today. “Pump Up the Volume” stars the ‘90s heartthrob Christian Slater and Samantha Mathis of “Little Women” along with the cast of up-and-coming stars, such as Seth Green, Ahmet Zappa, and Ellen Greene. The film tells the story of a high schooler Mark, played by Slater, who has recently moved to Arizona with his parents. Lonely and down on his luck, Mark starts a pirate radio show. He calls himself Hard Harry and comes on air every night at 10 in the evening to play the remaining gems of the late ‘80s music. His fearless and rebellious attitude make Hard Harry overwhelmingly popular with his peers, who have no idea that their beloved DJ is just a quiet, shy kid like them. Mathis’s character, Nora, one of Hard Harry’s die-hard fans, sets out to figure out the identity of the mysterious celebrity. On the same quest is the staff of their conservative and corrupt high school, turned upside down by Hard Harry’s involvement with suspended students. The pirate radio concept might sound familiar to many of us as it has been used in numerous films, most notably in Disney’s “Radio Rebel” and Richard Curtis’s super-hit “The Boat That Rocked”. “Pump Up the Volume”, however, is known as the earliest and one of the most outstanding examples of this concept. The film’s soundtracks album includes songs by Leonard Cohen, The Pixies, Ice-T, Beastie Boys, and Soundgarden. 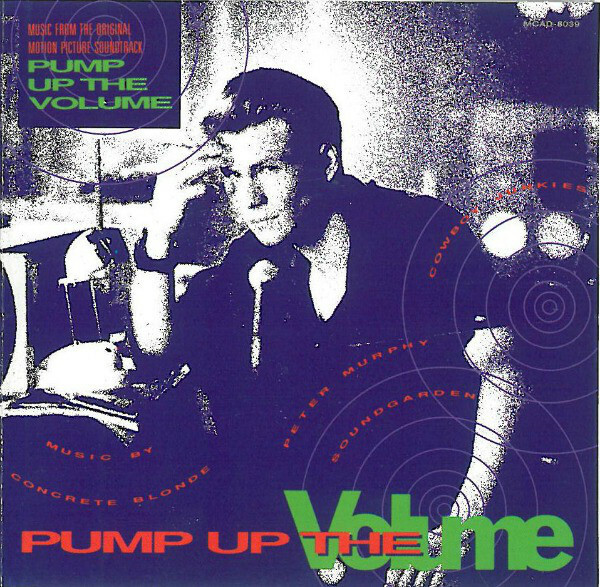 “Pump Up the Volume Soundtrack Album” was released by the MCA record label in 1990 and re-released in 1993. 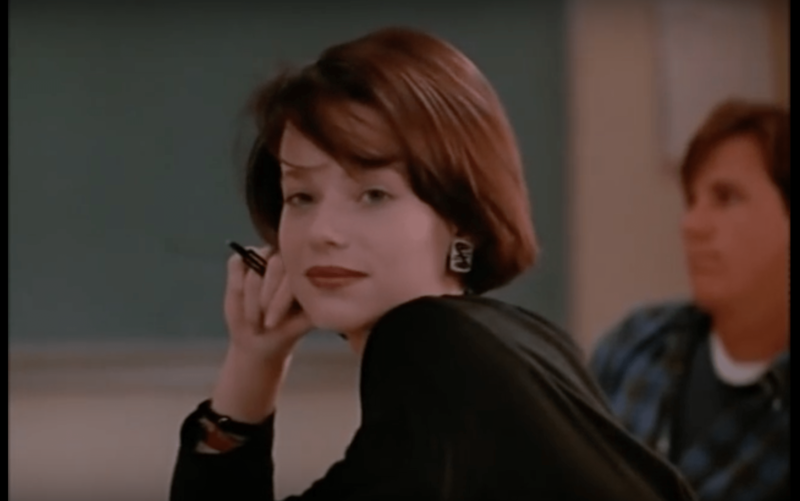 “Pump up The Volume” owns two awards, the Audience Choice Award of the 1990 Deauville American Film Festival and the Golden Space Needle Award for the Best Feature Film of the Seattle International Film Festival, scandalously beating that year’s fan favorite, “Jesus of Montreal”. The movie’s serious approach to the problems of adolescence was the real reason it resonated so well with the audiences. Instead of dismissing the issues as being too silly or insignificant, the movie recognized the problems of teenage self-identity, sexuality, and high expectations. Moyle’s choice to present the story through a teenager allowed the young generation to be heard and empowered over the last 28 years. “Pump Up The Volume” does not feature colorful hallways, prom nights, baseball games, or generic romances of a traditional high-school movie. It is a story of a tiny glimmer of hope in the sea of despair, never quite clear whether the glimmer will survive or break under the pressure of those very same realities that inspired it to arise. Will it be strong enough to continuously stand up against greed and injustice or will it surrender to the world of ignorance and labels?